Hee hee, thanks, the face is not quite as artistic as I planned! Don't you worry, there will soon be some cress "hair" to replace it! I will post a pic of him with hair, shouldn't be long now! 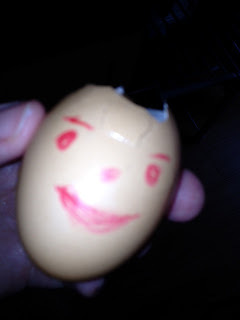 Fun with an egg, they are so versatile! Aren't they! I refuse to buy them in the supermarket anymore, I bought this from a basket with an honesty box in it on the side of a country road! Cheaper too.